Premier Smiles provides compassionate, comprehensive, dental care. Our services are designed to maintain, enhance, and restore your smile.You can count on Dr. Catalin Florin Arhiri to listen carefully to your concerns and clearly explain your options. Our entire team works hard to ensure that each of your visits to our dental office results in a positive experience. Dr. Arhiri prides himself on consistently exceeding expectations. He crafts life-like restorations to repair damaged teeth and is meticulous in his approach to every aspect of your care. In many cases, you can have a permanent crown that matches your smile perfectly in one visit. Your comfort is important to us, and our practice is committed to making dental care easy to receive because your oral health depends on it. Our Berwyn dental office offers a variety of treatments to preserve or improve your smile, including the following. Dr. Arhiri is dedicated to helping you achieve a healthy and beautiful smile, so you can expect the best when receiving treatment at Premier Smiles. From simple fillings to dental implants,we take a comprehensive approach to your care. We have equipped our state-of-the-art dental office with the latest technology for excellent results with maximum comfort. CEREC allows Dr. Arhiri to craft beautiful restorations in a day so you can have a strong and attractive smile without a long wait. Our warm and friendly staff is happy to answer your questions and provide flexibility when scheduling appointments. We value your time and avoid overbooking so that you can be seen promptly an be given our full attention. 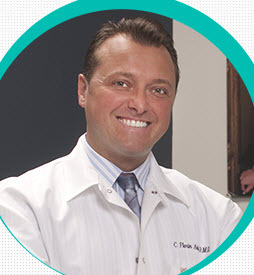 Our Dentist: Dr. C. Florin Arhiri is a compassionate and internationally educated professional, delivering world-class service in cosmetic dentistry and general dentistry. New patients click here to learn about appointments & payment options as well as find answers to frequently asked questions, download patient forms & more. Please browse through our website and be sure to contact us if you have any questions or would like to schedule an appointment. You may also use our online appointment request form to schedule your appointment. Wed: 11:00 A.M. - 8:00 P.M.